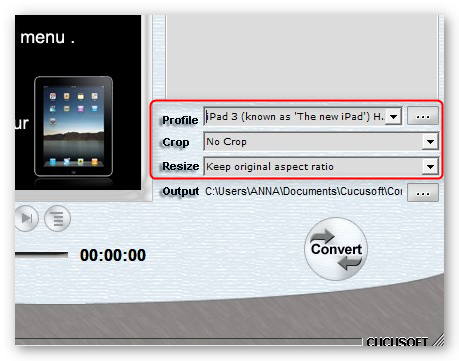 How to Convert DVD to iPad format using Cucusoft DVD to iPad Converter? How To Convert DVDs To iPad? The Fastest and Easiest Way to Rip your DVDs to iPad Format. When Apple released iPad, it gave the word "portable" a whole new meaning. Most of us regard iPad as the ultimate source of entertainment because it allows you to capture pictures and videos instantly, listen to your favorite music, watch movies or videos and so much more. With iPad, you actually have a portable DVD player without the physical DVD, all you need is the best software to assist you in this task. This is where Cucusoft DVD to iPad Converter becomes handy. 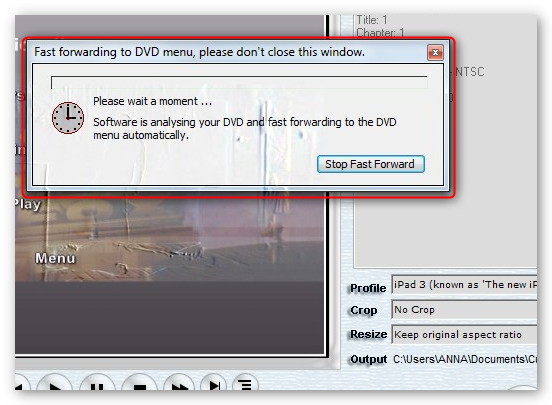 This software can convert all your DVDs to iPad compatible format in superb quality and at a fast conversion speed too. It is equipped with a powerful DVD decoder engine that can rip all DVDs even the ones with certain encryptions and includes a ton of useful features so you can customize the output to your viewing preference. 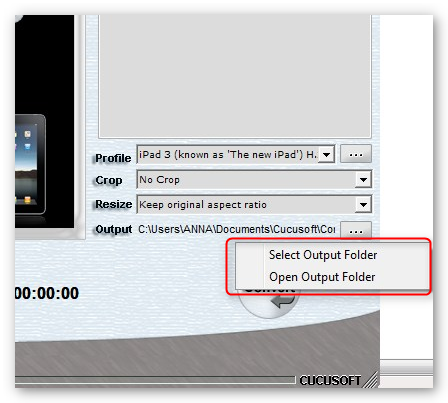 Just download Cucusoft DVD to iPad Converter on your computer and follow the simple steps below to start enjoying your favorite movies right away. 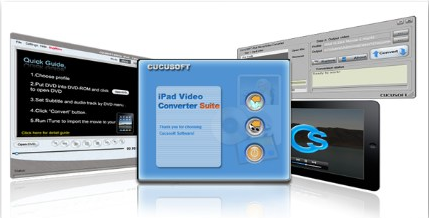 Step 1: Download and Install Cucusoft DVD to iPad Converter on your computer. You may download the trial version of the program from the Cucusoft website and install the program on your computer. Step 2: Customize Output Format. Choose the format of the video you would like to create from the "Profile" drop down box, located on the right side of the converter screen. You may also set the "resize and crop" option you prefer at this point. Step 4: Prepare the DVD For Conversion. Insert the DVD movie you wish to convert in the DVD drive of your computer. When the disc is recognized, please click the cancel button on the auto-play dialog box that may appear. 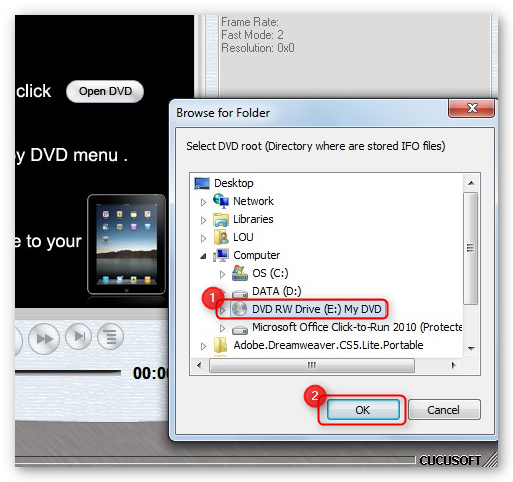 Next, click "Open DVD" on the Cucusoft converter screen, and you will get a dialog window then 1. choose the directory/drive where the DVD is located and 2. click “OK”. After you click “OK” it will then initiate an auto fast forward to the DVD menu then begin playing the movie. Step 5: Do the Conversion. Please click on the 1. "Convert" button and you will then get a 2. Ready to Record Video dialog box where you can choose the point where you want to begin the conversion, you may choose "convert from the beginning” etc. Finally, press "Yes" button and the conversion will automatically begin. The DVD conversion is now taking place. Step 6: Transferring Converted File. After conversion, transfer the converted files (you may “drag and drop” the files) to your iTunes so you can then sync your device with it.